The final score on the football field may not have made Fighting Irish fans happy, but on the connectivity side of things the new Wi-Fi network at Notre Dame Stadium scored a big win with 6.2 terabytes of traffic used during Notre Dame’s Sept. 9 home game against Georgia. 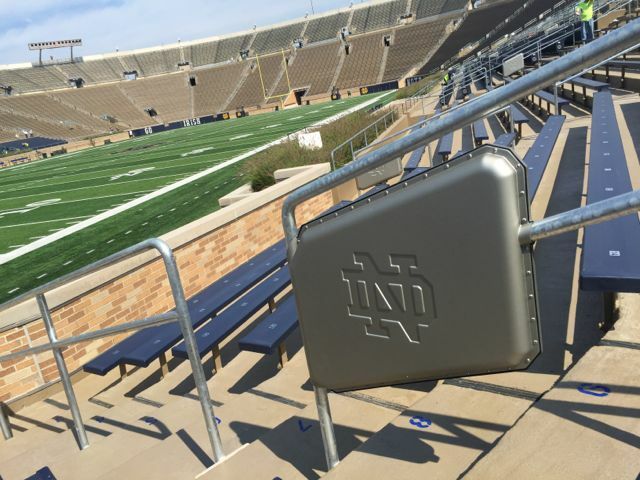 Deployed by AmpThink, the new Wi-Fi network is part of a $400 stadium renovation called Campus Crossroads that debuted in time for this year’s college football season. Mobile Sports Report got a look at the new stadium renovations, which include new premium seating areas and a large video board, during an August football scrimmage event that was open to fans. On Sept. 3, the Irish formally opened the stadium with a home game against Temple, which Notre Dame won 49-16. According to Notre Dame, the new Wi-Fi network saw 4.8 TB of traffic for the season opener, with 21,395 unique client connections and a peak concurrent connection number of 15,800. For the Sept. 9 game against Georgia, a prime-time night game that saw the Irish just fall on the short end of a 20-19 score, the network saw 6.2 TB of traffic, with 25,856 uniques and 19,475 peak concurrent connections. Total attendance for both Notre Dame games this season was 77,622, which sounds like the new sellout capacity for the stadium, a number not previously reported since the renovation. Notre Dame can probably expect another big network experience on Oct. 21, when the Irish host Pac-12 rival USC. No, they got a good deal. 🙂 Thanks for the catch!